There Is No Beyoncé Vs. Adele Grammys Face-off. They Will Both Conquer. History and data shows that both singers are going to have a big night. Standing taller than the rest at this year’s Grammys are Adele and Beyoncé, two extremely successful artists, nominated in multiple categories for their work on Lemonade and 25 respectively. Over the last few weeks, a one-sided media narrative has emerged that Sunday’s awards will be a dragout fight for all of the oxygen in the room. Vanity Fair called the awards “a battle royale between Adele and Beyoncé.” The LA Times headlined their post “Beyonce vs. Adele at the Grammys will be a battle of style.” The Ringer had game-day levels of excitement, writing, “Beyoncé vs. Adele Is the Best Grammy Face-off in Ages.” Even the New York Times went with the same angle, proclaiming “Adele vs. Beyoncé: What's at Stake for the Grammys?” But looking at the actual spread of the nominations, and supporting info from two big data companies, it looks as if there’s no basis for all the war-mongering: both artists will have extremely good nights. Of course, they have a history of being Grammys powerhouses. This year, Beyoncé became the most nominated woman in Grammy history, and has won 20 awards out of 62 nominations since 2000 for both her solo work and releases with Destiny’s Child. Adele has won 10 Grammys from 18 nominations since 2009, and has actually not lost a category since 2010. 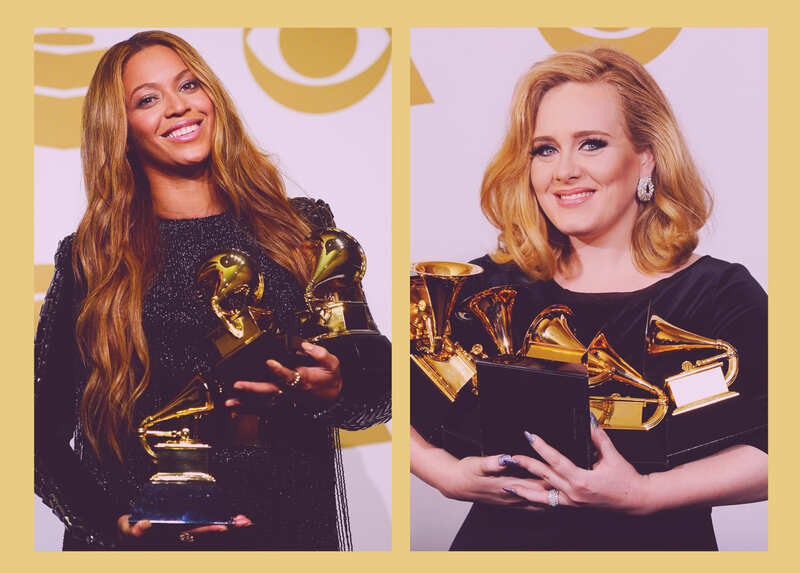 The two artists share the distinction of being the most awarded woman in a single night at The Grammys, with Beyoncé winning six awards in 2010 and Adele also claiming six in 2012. Clearly, they’re both heavy favorites with Grammy voters, and are pretty much guaranteed to pick up a few awards in genre-focused categories. Adele will surely win Best Pop Solo Performance, a category she’s won three times and Beyoncé has only won once. The British singer is also likely to win Best Pop Vocal Album, mostly up against first-time, younger nominees. Beyoncé faces a tougher battle to the podium with more nominations to her name, but stiffer competition in genre categories that she’s never participated in before, like Best Rock Performance and Best Urban Contemporary Album. That said, she is a past winner for Best Rap/Sung Performance and will likely have a repeat victory there. 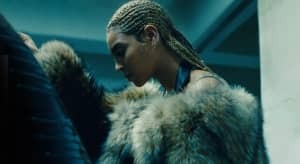 Lemonade was watched by almost one million people during its HBO premiere and it will likely pick up wins in the Best Music Film and Best Music Video categories, too. That already adds up to a big night for both of them, but all of the three major categories — Song, Record, and Album of the Year — are still on the table. Most online betting outfits give the advantage to Beyoncé in all three races, while some favor Adele in the album category. Adele won Album of the Year in 2012, and it’s pretty rare for an artist to have repeat wins in that category — only four artists, including last year’s winner Taylor Swift, have ever done it before. The Grammys is pretty famous for awarding Album of the Year to artists that are known to have been snubbed for their earlier critically acclaimed works or never honored in the category at all — Beck’s win over Beyoncé in 2015 is a good case study of this, as is Ray Charles’s win in 2005, and Herbie Hancock’s in 2008. Beyoncé has never won Album of the Year and so this one seems locked in her favor. But another data report, provided to The FADER by Nielsen, revealed Adele’s intense popularity in the States. The American public’s love for Adele has swelled since her six wins in 2012, and she’s never been more popular than at this moment. In 2014, the number of American consumers who identified as Adele fans was at 47 percent, and this year that figure reached 60%. According to Nielsen N-Score, Adele also scored the highest “likeability” score out of any musician in the world, with a 76% approval rating among Americans, while Beyoncé scored just 59%. Still, with all of the predictive data and online speculation in the world, it’s The Grammys — and there is nothing Grammy voters love more than an upset.